New “One Book, One Chicago” book is over 500 pages! 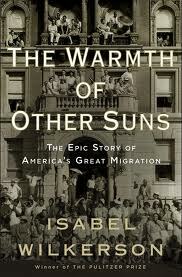 I just read the article titled ‘One Book’ choice details history of black migration to city from South about the One Book, One Chicago selection The Warmth of Other Suns. It is over 500 pages and non-fiction. We will have to start reading this one several months in advance of our October 2013 book discussion! I hope our students, faculty, staff, or community members will be willing to read the book and engage in a book discussion. When you have a book this long you only need one book a year. Instead of a One Book, One Chicago selection in the Spring and Fall.